LEGO Worlds Release Date Revealed for PC, PS4, and Xbox One | Nerd Much? The LEGO Worlds release date has been set! This Minecraft-like open-world game lets you build and explore to your heart’s content. Warner Bros. made the announcement this morning that the LEGO Worlds release date has been set for February 21, 2017. The game will be released for PC, Xbox One, and PS4. 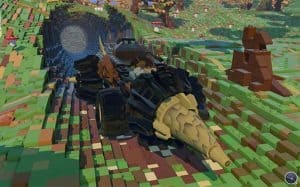 As PC users may already know, LEGO Worlds has been available for STEAM Early Access since last year. This has allowed players to provide helpful feedback for improvements. Ever since Minecraft hit the market, people dreamed of something similar from LEGO. After a long wait, that dream is finally here. LEGO Worlds offers a cooperative and competitive multiplayer experience whether it’s local split-screen or online. On your quest to become Master Builders, you’ll discover a wide variety of creatures, characters, vehicles, and environments. You can also partake in missions to help people along the way. These could be finding a lost sword, protecting crops from a zombie attack, or even just building someone a home. The tools available are incredible. You can plop down a premade home, or you can build something new brick by brick. Even the landscape can be sculpted with ease. We can’t wait soon enough for the LEGO Worlds release date. The building game we all thought of is finally here, and it looks perfect.